Stone lanterns are easier to find. Cast iron Japanese garden lanterns are actually quite unusual. 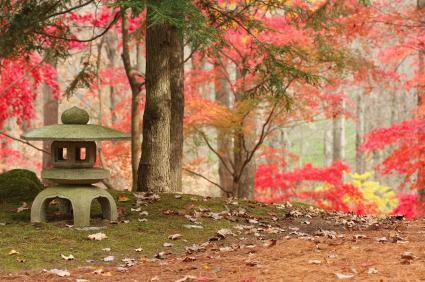 You're more likely to encounter stone pagoda shaped lanterns at your local garden center. If you do find a cast iron Japanese-style lantern, it's probably listed as a vintage find or an antique, or a copy of an antique lantern. It's rare to find a genuine cast iron Japanese lantern, but authentic ones typically hail from the Meiji or Taisho period of Japanese history. Some cast iron lanterns were used in temples before the Meiji period, but the ones typically found for sale today hail from the time period between 1868 and 1926 when mass manufacturing made them affordable export items. The Meiji period lasted from late 1868 to 1912 and was the start of what was later known as the Empire of Japan. The word "Meiji" means "enlightened rule." It was during this period that Japan experienced its first push towards industrialization. Many foreign experts in metalworking, for example, came to the country to teach English, engineering, the sciences and more. Japan became a leader in many manufacturing industries. Because Japan's raw materials were limited by its geography, the companies focused on innovations in manufacturing, buying in raw goods from foreign powers and quickly leading the way in textiles and other industries. It was during this period that the first cast iron lanterns appeared. Most were meant to hang from the porches or eaves of the home or adorn the porches of temples. Manufacturing of such lanterns continued into the Taisho period, which immediately followed the Meiji period and lasted until 1926. Most of the reforms during the Taisho period were in government and democracy, and World War I caused many manufacturing firms to switch from decorative items to items needed for the war. Genuine lanterns from the Meiji or Taisho period are rare, but not so rare that you cannot find them on the secondhand market. There are also copies on the market, so be careful and purchase only authentic lanterns from a reputable dealer. You may also want to purchase genuine antiques in person so you can examine the lantern carefully. Hook at the top of the lantern: A chain would pass through the hook or ring so that the lantern could hang from a porch. Moderate size: Most cast iron pieces were approximately 10 to 12 inches tall, although there are some variations in height. Traditional themes: Traditional themes used to decorate cast iron lanterns include cherry blossoms, bamboo, and many others. Patina: Iron rusts over time, and authentic antique lanterns were made to be used outdoors, so expect some rust or wear and tear on cast iron lanterns. These lanterns were meant to be used outdoors, and a pristine one should spark some questions. Either it was kept inside for over 100 years or it's a copy. You can see an authentic cast iron Japanese garden lantern at the Peabody Essex Museum in Salem, Massachusetts, which is said to contain several fine examples of period lanterns. Here is an image of an antique lantern showing the extensive rust typical of early pieces. Some enterprising wrens decided to use the antique lantern for a nest! Japanese garden lanterns are an exquisite accessory to add to your Japanese or Zen garden. Because antique lanterns may be expensive, you may wish to add copies to the garden or stick with concrete and stone copies. Stone and resin copies of Japanese garden lanterns are easy to find online and at your local home and garden center. eBay is a good source to find authentic and reproduction cast iron lanterns for sale.